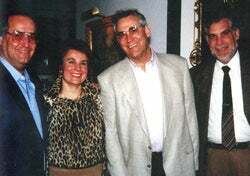 Marc Beige (third from left) with his two siblings (on left) and co-owners of Rubie's Costume Co. In the two weeks leading up to today, Marc Beige has barely left his Queens, N.Y., office. He has kept his calendar empty -- save for issues needing immediate attention. And he hasn't taken just anyone's phone call. While the 62-year-old president and CEO of Rubie's Costume Co., is hardly reclusive, during the final days before Halloween, Beige had spent hours poring over how well this year's costumes are selling. Will Lady Gaga still be white hot? Will Charlie Sheen be just another celeb flash in the pan? Will KISS still bring in the crowds? These are the questions that keep Beige up at night, not the things that go bump. Beige may be spooked, but he's not nervous. Rubie's Costume Co. has grown from a mom-and-pop shop into a thriving, $100 million mass-market juggernaut with the rise of the Halloween industry. And after nearly four decades of running the New York-based costume manufacturer with his brother, sister and, more recently, their children, knowing what costumes and accessories will be in demand year by year has become second nature. Of course, nearly cornering the market in Hollywood- and comic book-character licenses also helps. With more than 150 active licenses, Rubie's offers a wide cast of characters -- from Superman and Batman to Princess Leia and Smurfette -- to help keep the costume-maker's books in the black. But, of course, you never know how edgier or new costumes will perform. "It's more of an art than a science," says Beige. This year, Beige is watching the sales of costumes inspired by celebs like Michael Jackson, Rihanna, Katy Perry and the cast of Jersey Shore, among others. He's also keeping a close eye on DC Comics' Green Lantern superhero, which was the subject of a 2011 film, as well as the popular Monster High dolls from Mattel. If history is any indication, 2011 is due to be another banner year for the company, which has operations in 14 countries and employs more than 3,000 workers worldwide. Despite Halloween landing on a Monday -- a day of the week in which fewer adults are inclined to dress up -- Beige expects the company to reel in annual revenues of more than $100 million, a figure consistent with last year's. Though giant by costume-company standards, the company's beginnings were humble. Launched in 1951 as Rubie's Candy Store in the working-class neighborhood of Woodhaven, Queens, by Beige's parents Tillie and Rubin -- the company's namesake -- the original shop sold everything from newspapers and cigarettes to soda and ice cream. 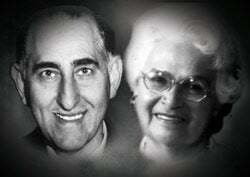 Rubin and Tillie Beige founded Rubie's Candy Shop in 1951. But Beige's parents, he says, were "more ambitious operators." They took a chance on Halloween long before it even remotely resembled the $7 billion behemoth that's often regarded as the second largest commercial holiday in U.S., according to the National Retail Federation. "They sold a lot of holiday knickknacks and mostly plastic masks," says Beige, who lived with his family behind the store until the late 1950s. Seeing the potential of holiday hijinks, the Beiges in 1959 moved a block away to a larger location and renamed their shop Rubie's Fun House -- which sold joke items and holiday merchandise. Overtime, Rubie's also began manufacturing costumes for rental companies. Rubie’s 1976 bicentennial collection. Marc Beige (middle) is modeling an Uncle Sam outfit. But its stake in the retail Halloween costume market was more of a fluke, says Beige. 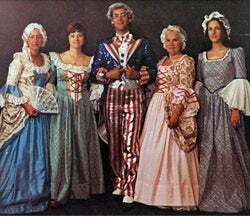 In 1972, his father passed away -- leaving the reigns of the company to his wife Tillie and then 23-year-old Marc, who took over as president and renamed the business Rubie's Costume Co. At the time, he says, the 1976 U.S. bicentennial celebrations taking place all over the country increased demand for costumes. "There was no place to purchase a relatively good-looking costume that could be a replica," says Beige who noted the opportunity and quickly got to work building a line of costumes for the celebrations. Once the parties ended, he thought: Why stop now? In 1973, Rubie's Costume Co. had begun making full-length costumes that Halloween revelers could buy outright. But after the bicentennial the company began to ramp up production in a big way. Initially, it sold to rental shops. Today, it sells to every major retailer, including Wal-Mart and Target. Rubie's costumes typically sell for $20 to $50. Though for $1,000, you could snap up a life-size replica of the Star Wars' Stormtrooper uniform. "We literally helped create the industry as we went along," says Beige. It likely helped that Rubie's also made a number of strategic acquisitions through the years. In addition to purchasing an arsenal of licenses, which generally last for two to three years and vary in cost depending on anticipated sales and demographics of sales areas, Rubie's acquired some of its competitors. In the 1990s, Rubie's purchased Halloween-costume pioneers Collegeville and Ben Cooper, which manufactured the now-famous Richard Nixon mask. The mergers allowed Rubie's to pick up valuable licenses like Batman and Barbie, in addition to a make-up manufacturing facility located in Phoenix. That strategy has helped Rubie's hook retailers, says Todd Kenig, co-founder of Ricky's NYC, a New York-based chain of beauty-supply and Halloween costume stores. "Of the top movies that come out, it's usually Rubie's who gets that license," says Kenig, who has been buying from Rubie's for about 14 years, now purchasing about $2 million to $3 million annually. The success of Rubie's is due in large part to it still being family run, according to Kenig. "Family businesses have different values than corporate businesses," he says. "That's why we get along… I'm one of the biggest Halloween guys in N.Y. and I've never met the CEOs of the biggest Halloween companies." But even if Americans lost their taste for Halloween candy and costumes tomorrow, Rubie's would likely be able to fall back on its stake in other costumed occasions. In addition to making lingerie, the company produces a line of Santa, Mrs. Claus, Elves and other party gear for holidays including Christmas, Mardi Gras and Saint Patrick's Day. The company makes customized costumes for private clients like the Rockettes and the Macy's Thanksgiving Day parade. And, more recently, Rubies has begun outfitting foreign revelers for Carnival and other locally celebrated holidays like the Day of the Dead in Mexico. "We've been at this for a long time," says Beige.